Get ready for some Super Bowl football with these decorated Football Cookie Balls. Cookies are processed into crumbs then added to cream cheese to form a dough. Dip balls of dough into chocolate and decorate like footballs for the big game! Football season is here! Will your home team make it to the Super Bowl? 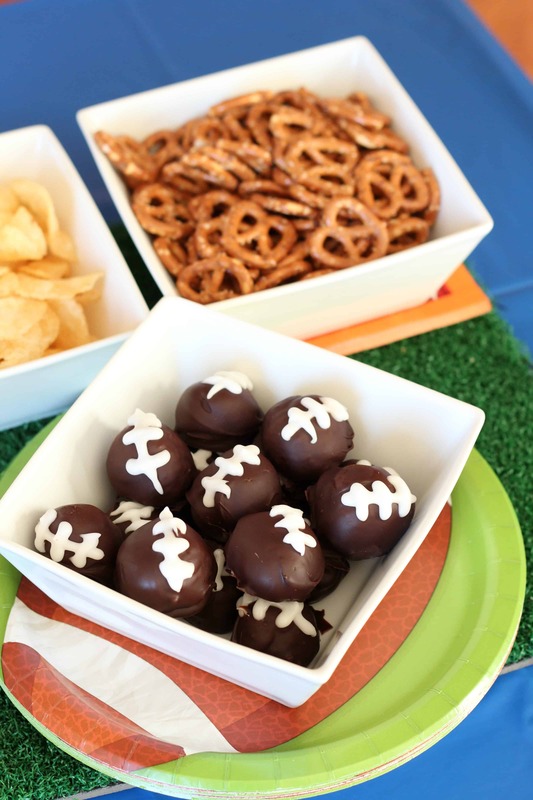 Whether or not you are reigning Super Bowl Champs or if you are rooting for your kids’ flag football team, you’ll need to have football themed desserts and treats to celebrate the season. 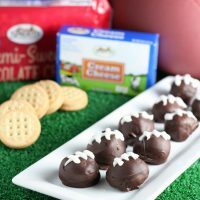 Get your game day menu started with these Football Cookie Balls. Whether you are cheering on your child’s team or your favorite NFL team, football season brings with it plenty of reason to gather with friends and enjoy good food. Chips and dips often get the spotlight for football party foods but there is always room for a quick and easy dessert at your tailgating spread. These playful cookie balls should be thought of as cousins to the ever popular cake ball. Super bowl game day food has taken on a life of its own. From chicken wings to chips and dips, the spread of food that fans make on the day of the game sometimes is more interesting than the game itself. I like adding a football themed dessert to the buffet. 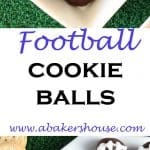 I’ve made football cookies and football brownie bites, and think these football cookie balls are a lot of fun too. So what are cookie balls you might ask? Just like cake balls. Did you miss the cake ball craze? I’ll fill you in– cake balls are made by taking crumbled up cake, adding icing, making that dough into balls then dipping the balls into chocolate. Same idea here but with COOKIES! No baking required. I used Sprouts Vanilla Sandwich cookies which were pulsed into crumbs, added cream cheese then dipped the balls into semi-sweet chocolate for an easy no bake dessert. A quick white icing of powdered sugar and milk is whisked together then piped on to the footballs to make the stitching on the balls. Check out this easy Ziploc Bag Icing Trick as a fast way to pipe icing when you don’t have a fancy pastry bag handy. You can use this short cup on cakes, cookies, and cupcakes too. Decorate with sprinkles in your team’s colors or make the white lines on top to turn these chocolate truffle-like dessert balls into footballs. Get ready for some Super Bowl football with these decorated Football Cookie Balls. Place cookies in a food processor and process until cookies are small crumbs. Slice the cream cheese into smaller pieces and scatter over the cookie crumbs. Process until well blended into a dough-like consistency. Scoop approximately one tablespoon of the dough and shape into balls with your hands. Refrigerate on a parchment lined pan for at least 30 minutes. Melt the chocolate chips in a double boiler. (Alternatively use a microwave at 50% power in 30 second increments until the chocolate has melted.) Dip the balls one at a time into the melted chocolate. Use a spatula to rotate the ball so that it is covered with chocolate on all sides. Gently lift up the ball with a fork; tap the fork lightly on the side of the saucepan/bowl to allow the excess chocolate to drip back into the bowl. Set on a parchment lined baking pan then place into the refrigerator until the chocolate is set. Optional white icing: Mix the powdered sugar and milk in a small bowl. Whisk until smooth. Place the icing in a zip loc bag then cut one corner of the bag so that the icing can be piped onto the footballs. Keep the cookie balls refrigerated (if at home) or in a cooler (if tailgating) until ready to serve. Use gluten free cookies if you wish for these Football Cookie balls to be gluten free. This data is provided by Nutrionix and is an estimate only. I used Sprouts Brand ingredients in this dessert. 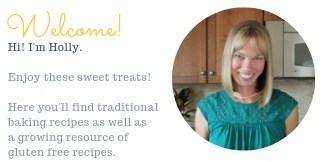 Check out more tailgating ideas, recipes, and tips at Sprouts Brand website. Sounds good Holly! Football has never been my favorite sport, but the food sure makes it go down easier! These are adorable and I bet delicious too.